In my previous post shared my thought about How to play youtube video in Xamarin.Android, How to implement sliding menu in Xamarin android and in iOS, Best Practice and issues with ListView in Android Xamarin, How to avoid ImageBitmap OutOfMemoryException and Rounded corner Image in android Xamarin,Drawing path between two location in xamarin android. There are many way to store data in mobile application like in shared preference,user default, text/json and Xml file etc. Whenever user need to store large data, SQLite is the better option. It is best practice to communicate with the database with the background thread without blocking the UI thread. 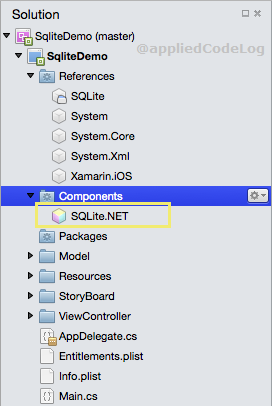 Here i'm using xamarin Sqlite component to perform the Async CRUD operation. In this example i'm adding the new contact entry to phonebook,update the existing contact and deleting a contact. 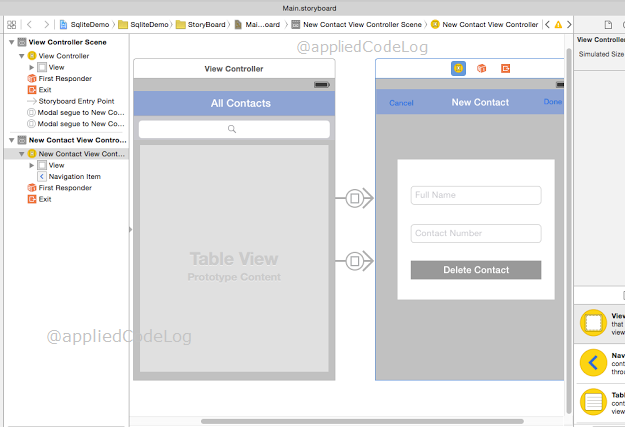 Step 1: Prepare the UI part for display and edit phone contact. I have done the following things on storyboard. Add SQLite component provided by the Krueger Systems, Inc. to the project. Step 4: Create SQLite connection class. To support async operation need instantiate SQLiteAsyncConnection class. Step 5.) Initialize the async connection object and create table. Declare the async connection object once and throughout the viewcontroller only this single connection object is used for the SQlite connectivity. CreateTableAsync creates the table of specified type if the table does not exist. Insert a new record of type PhoneContactLocalClass. It returns no of rows affected. Fetch the record in alphabetical ascending order of a contact name. This is the code snippet for SQLite async CRUD operation. Below added the ViewController part of a project. Browse the complete project here : https://github.com/suchithm/SqliteDemo.iOS/ Comment if any suggestion/Bugs. Thank you :) .